If you enjoy reading this, please subscribe to my blog by selecting the follow button. Thanks!! Just as a side note, I used to write the outbound and return flight report in the same post. From this report on, I have separated out the posts. This will make it easier for people to search and also make a clearer break between the legs of the journey. I had a wedding to attend in Jakarta and made the decision to travel to that city for first time since living there in the 1980s. I don’t remember that much about it, except the traffic was pretty rough. And I can only imagine it got worse with the massive increase in population over the last few decades. And given my recent defection to British Airways, I don’t get that many opportunities to travel SQ. My trips to Thailand are now focused on Tier Points (Cathay Pacific) or cost (JetStar). 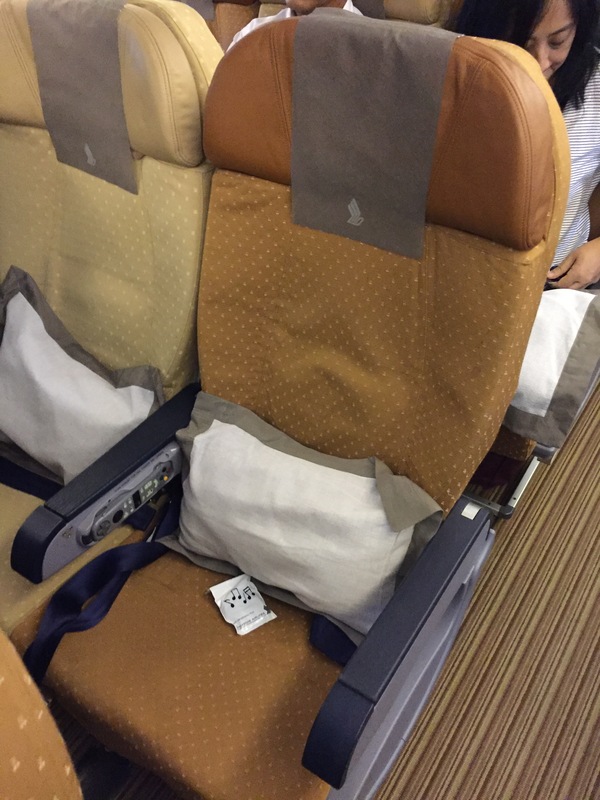 So when I do get “forced” to flying Singapore Airlines, I do try to make the most of it! 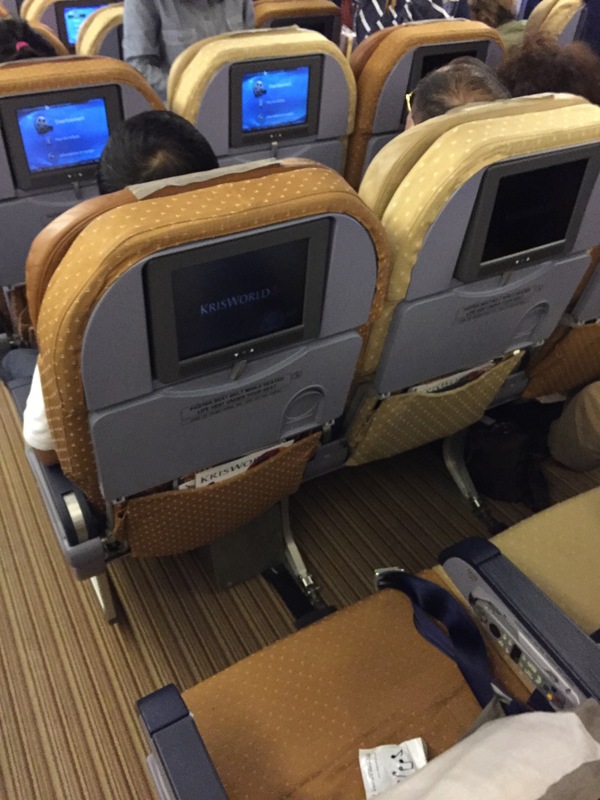 And I generally love it — you can see my last SQ trip report to Manila here, where I got to travel Business Class on the way home. I needed to get to Jakarta for a Friday, and from Singapore that would mean leaving on a Thursday evening. I had a choice, to take the slightly earlier flight in the evening at or the really late flights. Unfortunately there are no One World carriers that fly the route I need for this trip which was Singapore to Jakarta. So I was left to choose from a whole bunch of airlines which flies direct – Singapore Airlines, Tiger, JetStar, Lion, Garuda, Batik Air. As such I decided to fly SQ. 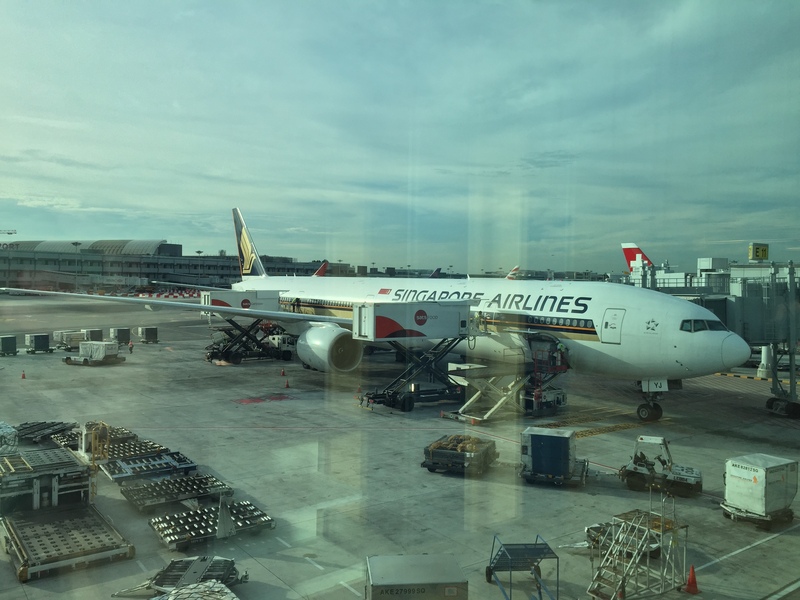 The outbound flight was due to be a Boeing 777-300, while the return was scheduled to be an Airbus 350-900, which was very exciting for me as I had been reading about the decision by Singapore Airlines to re-start their non-stop US routes. Then there is a the question of destination. Of course they are pretty much guaranteed to restart their previous direct US routes to Los Angeles and New York, which is what they pretty much said in their press release. However, where else? Would it be possible to fly to Houston without stopping? Probably not. Using Travel Math, it works out to be around 9,700nm, while the A350-900 ULR is likely to only have a range of 8,700nm. While I would personally like to see places like Vancouver restarted I’m not sure about the business case – they after all stopped that service back in 2009 (and that was already via Seoul). Anyway, I am looking forward to it either way. Roll on 2018!! hmmmm interesting … I seem to have gone completely off on a tangent. So back to the flight. SQ offer reasonably priced fares if you are happy with heavy restrictions no refund, no change, 10% mileage accrual. And since I knew I would want to be travelling on those dates I decided to go for it. So I went for and Economy Super Saver fare, which basically means, if something goes wrong, I’m up the creek without a paddle. If need to make a change for whatever reason … well I can’t! But the fare was competitive with JetStar. Also given I needed to bring my suitcase, the inclusive luggage allowance helped. On top of the that, without lounge access, getting a meal on board was also a good thing!!! I’m sure I could have scored some awesome deal flying another airline. But frankly as I’ve got older, I’ve got a whole lot crankier when it comes to travelling. 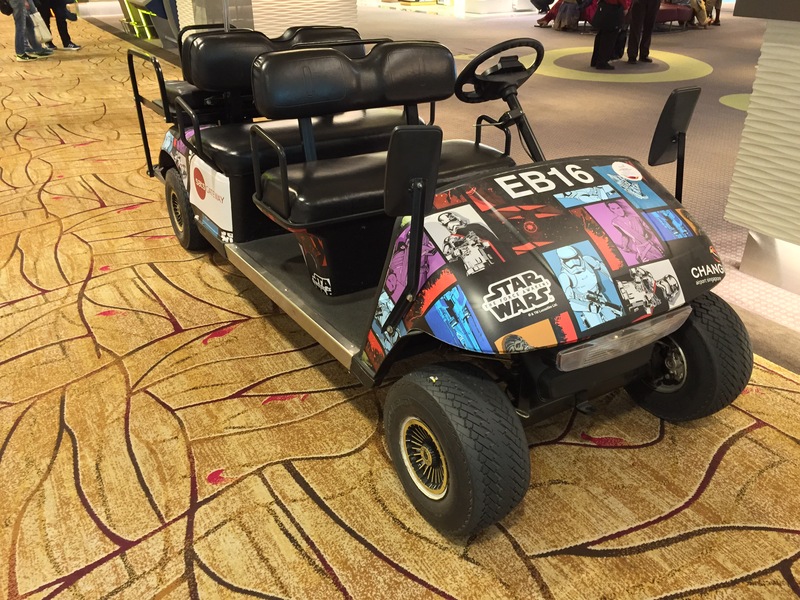 Now that SQ are offering these Economy SuperSaver flights, I no longer need to fly JetStar. I can continue to fly Singapore Airlines. After all, she is a great way to fly! 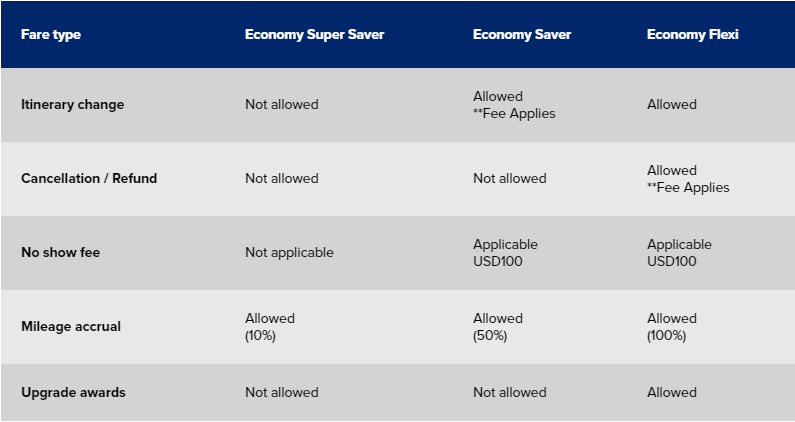 To Bangkok I will now always be looking to fly Cathay if they are available and the prices are reasonable (not always the case for either of these points) – Singapore airlines also offers flights with similar pricing. The main problem is that on this route JetStar is way more competitive. Offering fares of close to half the two main carriers. This must be down to the demand of the route. Kinda annoying, but I keep my eyes peeled like a hawk to the pricing of Cathay! My general rule in Singapore is to get to the airport at least an hour before the flight is due to take off. So with the flight leaving at 6.30pm my aim was to get to the airport by 5.30pm. Having worked out my schedule from my work to Changi Airport. 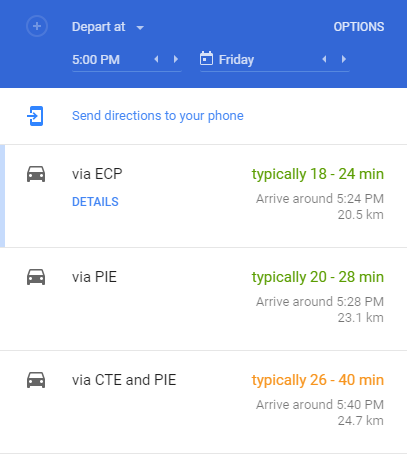 According to Google Maps (who of course I totally believe) it would a grand total of 24mins via ECP (East Coast Parkway) or 28mins via PIE (Pan Island Expressway). God forbid I should choose to take CTE (Central Expressway) and PIE route which could take up to 40mins. So if I really planned it out, I could leave the office at 5pm and just about make it to the airport by my 5.30pm deadline. Tight but dooable. If I wasn’t cutting it so fine, I would normally go from work and take the MRT as the line is pretty reliable and actually if there is some nasty traffic on the roads, is pretty quick — less than an hour door to door. Bear in mind that if you are coming all the way from the west side of Singapore, the trains do not go all the way to Changi Airport (I already talked about this is my guide of the MRT). It stops at Tanah Merah, and you have cross over the platform to get on the shuttle service to Changi Airport (and the Expo centre). I suspect it’s because there is insufficient demand from Changi into town. However, as I was right on the edge in terms of timings, I decided to take the (apparently) fastest ECP route. I then prayed that no one had an accident – including yours truly! Not just because it is an awful thing to do, but also because of the time scale I had to work within! Sometimes I try to save pennies by not booking a cab and just wait in line, but because I was running on such a close run thing, I decided booking was the only option. Depending on what I’m trying to achieve, I typically like using the GrabTaxi app but I also use the Comfort Delgro app. I don’t have a huge preference, but don’t like paying with cash and would prefer to use credit card. Anyway, while beavering away at my desk, I suddenly realised it was already almost 4.30pm. Anyone who travels from Singapore knows that anytime between 4.30-6pm is a terrible time to get try and book a cab as everyone is trying to leave. So I desperately tried to finish my work and at the same time needed to get a cab. My original technique was to book a Comfort cab as I like to be able to charge it to my EZ Link card – which is linked to my credit card… and thus I get miles from it 🙂 However, ever since GrabTaxi (now called Grab) allowed me to pay using my credit card, I am happy to just take whatever comes first. I went with Grab Economy and within a minute I had a booking and they were kind enough to upgrade me to Premium … but to be perfectly honest I couldn’t tell the difference. When I got to the pick up point, there was a nice BMW. Don’t ask which model as I’m not that much of a car enthusiast! Fortunately this was not a Friday departure, when it is really really busy. Friday traffic is usually characterised by people trying to go home, go out or go to the airport. Anyway, being rush hour it was still a bit of challenge to get a cab. There’s not much to say about the journey other than it was pretty good. I have had some experiences in the past with taxi drivers who have absolutely no sense of highway code or speed limit. This driver had a good sense of both. And the journey did indeed take less than 30mins so I was actually at the airport around 5pm. And since I was in the cab, I decided to try and check in online which seemed to be a success. Since I had already checked in online, I only needed to drop my bags. There was only one hitch, after printing my luggage tags, the kiosk wouldn’t print my boarding pass. Cue panic!! The staff standing by came over and said “oh, this happens quite a bit, just go the counter”. Rushed to the counter and the man behind the counter basically looked at me like I had made a mistake and asked “have you tried using the kiosk?”. I did feel like giving a sarcastic reply, but no, I restrained myself “Yes. Your colleague sent me here as the kiosk stopped working”; and with that he just simply printed it out and I dropped my check in. Off I went through immigration and yes, it was as smooth as ever. I have a local ID card, so I just go through the electronic gates and usually this is a very fast procedure. The only times I have had problems was when landing, and there are lots of flights coming in at the same time. There was no time for a trip to lounge on this trip. I arrived almost exactly at 5pm so by the time I finished with the bag drop and going through to immigration, it would be time for me to get to the plane. As I don’t have the appropriate star alliance frequent flyer card, I would have had to tap into my Priority Pass and thought that maybe it would be best reserved for when I really needed access. I would like to say that I went straight to the gate as that would be what a responsible traveller would do. However, I am also a responsible traveller, and didn’t want my neighbours complaining about the fresh smell that gently wafted from me, as I had come straight from work. So what does any self respecting smelly person do? Make themselves even more smelly. I popped over to duty free and started liberally squirting aftershave all over myself, while trying to avoid the hawk like eyes of the sales staff. It became a game of cat and mouse … I would make a move for one aftershave and one sales attendant would appear at myself … speaking Chinese. I smile. Spray myself, and then get greeted by more Chinese, getting a bit more energetic. It’s at this point I normally land my distraction “oh I don’t speak Chinese”. This usually throws the salesperson for a second as they switch their brain to English mode, by which time I have already scampered to another corner of the smelly section. This game is even better with larger groups — the salespeople don’t know who to target, and usually go for the richest looking. Moral of the story: dress and smell like a tramp. Anyway, waves of aftershave later, I was ready for the plane. I looked like a tramp but at least I smelt a million bucks! Finally made it to the gate and as usual security was efficient. 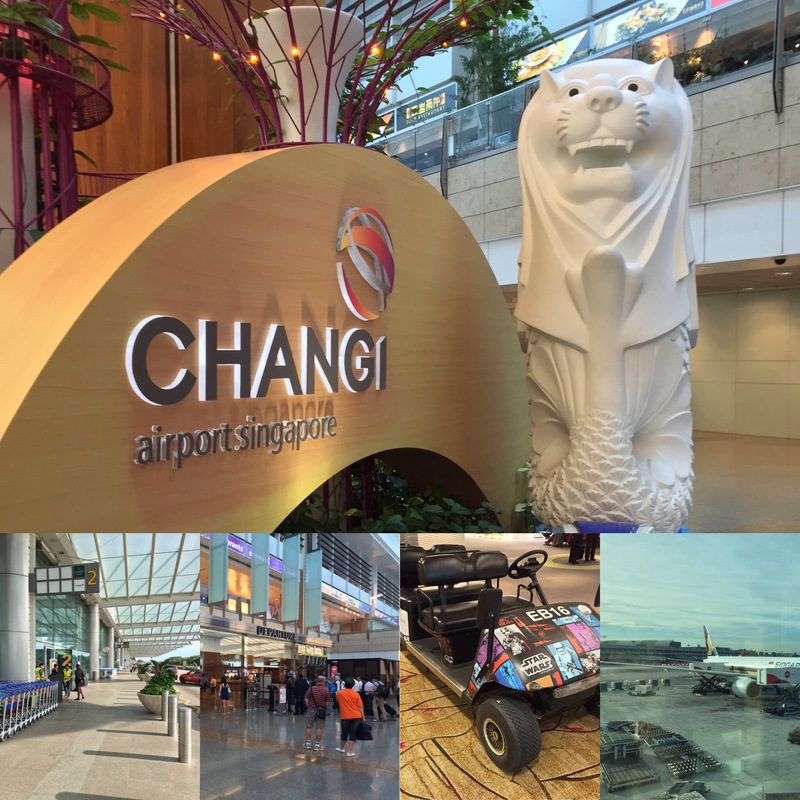 I have to say, of all the airports I’ve been to, I still like Changi the most. The worst part is that when it just slips from those high standards (and at levels that would make other airports blush) I get frustrated and have to remind myself, that these things happen everywhere. Anyway, on this occasion, nothing to complain about! 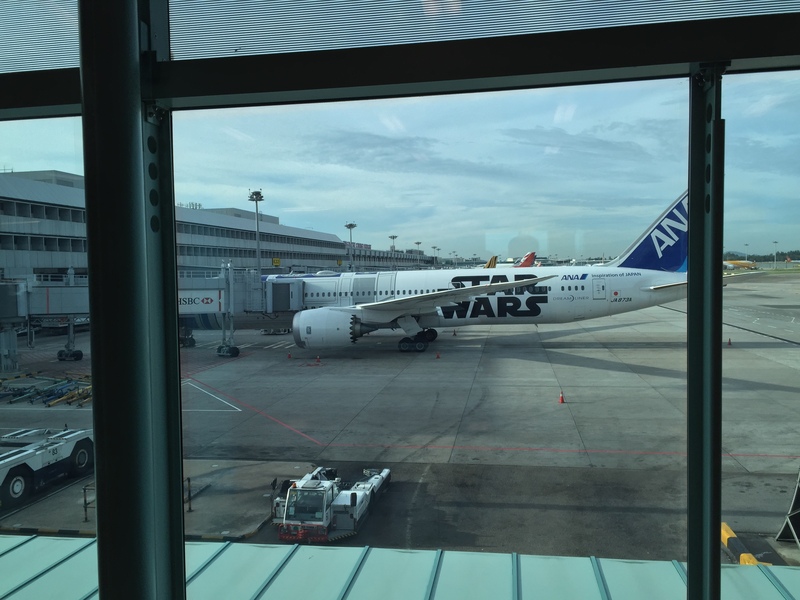 And as I walked through, I saw the plane that would be carrying us to Jakarta. Now I had mentioned previously that I was running late. Well actually I wasn’t. They should have been boarding when I arrived at the gate but apparently the plane was late getting in so we were delayed in boarding. Finally after the turnaround had been completed, they started boarding, and it was a quick affair. I don’t know if I’ve seen it quicker on a wide body before. I was seated in 36D which is near the front of the rear cabin. Unfortunately this is a slightly older plane so it doesn’t have a particular IFE system. Wait for my return journey where you get to see a really great set up. Again, if this was any other airline I would be happy with what I’d been given, but this being SQ, I expect nothing but the best. The captain came on the tannoy and apologised for us being late and I would try to make up time on the flight out to Jakarta and soon we were off. 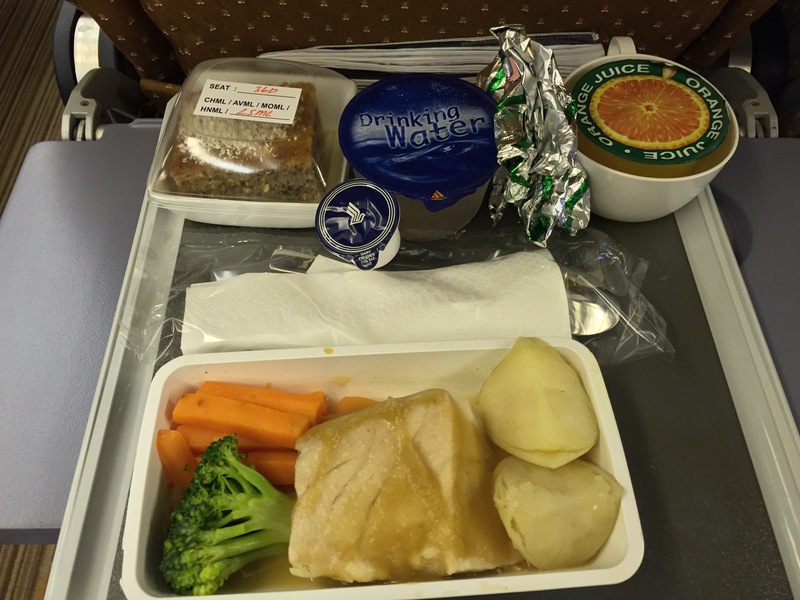 This being Singapore Airlines, they serve you a meal. And at this time, I was reasonably happy to pay for this privilege. 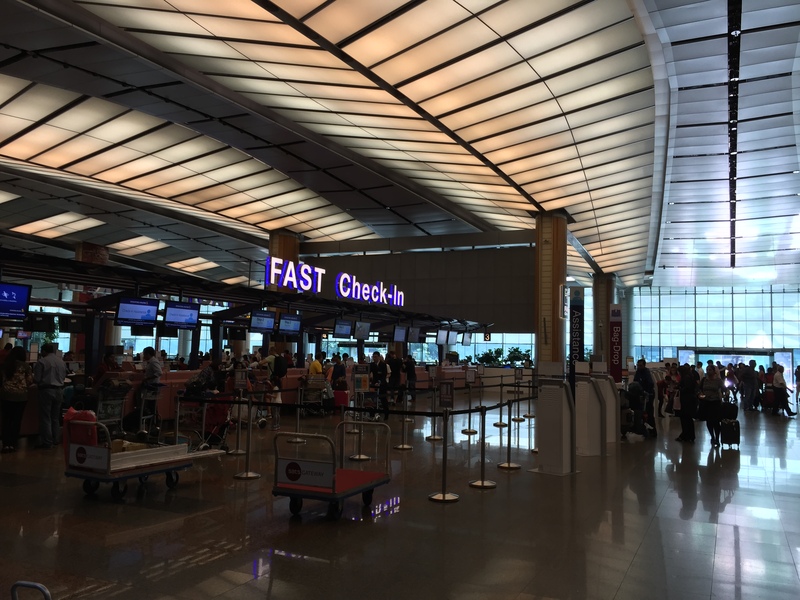 Having not been to Jakarta for such a long time, I had no idea how long it would take me to get through immigration and customs, and thus had no sense of what time I would get to the hotel. And thus eating on the plane seemed an eminently sensible option. I pre-ordered a low salt meal, as I have been eating pretty badly the last few months (you can see all the crazy food I eat in Singapore in my Singapore Food Tour category). As soon as the seat belt sign was switched off, the crew swung into action and started serving the meals and they really served quickly! It was some kind of fish, which I didn’t really care for. It was very very fishy. The kind of taste you get when eating a fish that seems old. I’m sure it was fine, but it just didn’t taste nice at all. In the end I left half of the fish and finished up the potatoes and vegetables. The crew came around quickly and cleared everything up. I couldn’t understand why they were moving so quickly until we started our descent. We were actually going to be arriving early despite leaving half an hour late. Just goes to show how much they pad out their schedules. We landed with little fanfare, and by the time we got the gate we were probably 15mins behind schedule so I couldn’t complain and made my way to immigration. To confess I was slightly rushing my way to immigration as I was worried about the queues at the counters, that are synonymous with evening flights. But no. I’m not even kidding, there was almost no one at immigration. I take the APEC lane and was surprised to see that the normal immigration queues were just as short as the APEC queue. But to get through immigration so quickly probably unfairly raised my hopes about luggage collection. Of course 15mins after getting the baggage carousel I was still waiting for my luggage. I didn’t want to take check in, but I was carrying too much so needed to check in at least some of my gear. Finally, after my luggage finally emerged I dragged it past customs (through an x ray machine) and out into the arrivals hall. Taxis are one of those perennial problems that I face when going to unfamiliar countries. I realise that many locals use taxis without any issues, but exactly because they are local. Most of the time I don’t speak the local language, and even worse, when I open my mouth, it is almost as if people assume that money is pouring out!! This tends to make me a prime target for touts so I have to be on my guard when I’m arriving at an airport. Jakarta airport is no different. As you make your way out of the arrivals hall you end up with many people trying to tout for business or to “help” carry your luggage. 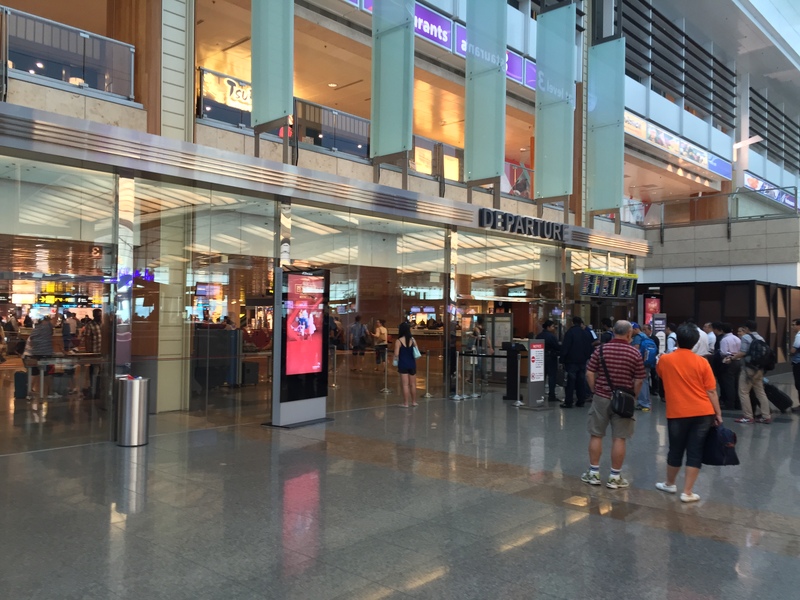 I was originally going to buy a SIM card at the airport, but received advice from invisible at FlyerTalk to buy it once I get into town as it would be significantly more expensive in the airport. 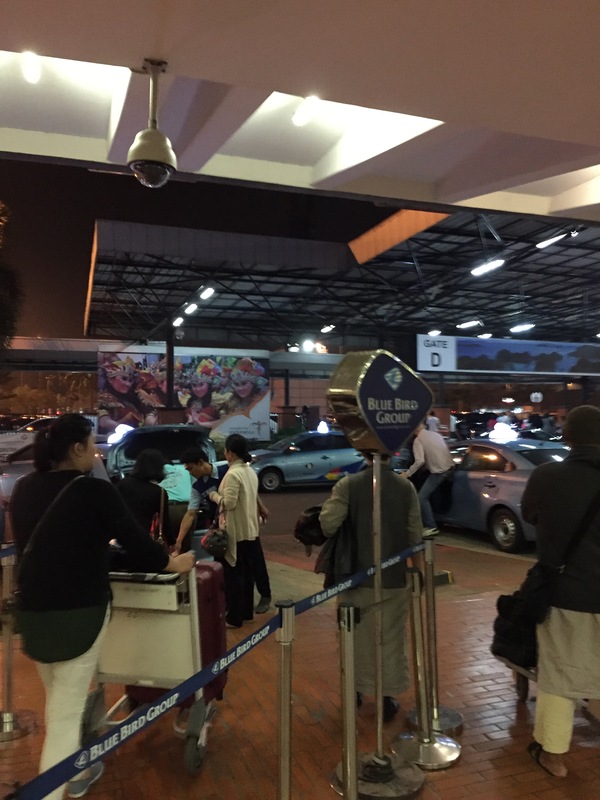 I had read prior to getting the Jakarta that there a several reasonably safe/reliable taxi companies that service CGK. These have their separate taxi ranks at the terminal, and to get one of these taxis you need to queue up. From my previous research I found out that Silver Bird was the most expensive, followed by Blue Bird, and lastly Ekspress being the cheapest. I originally thought I would get the Silver Bird as it was most likely the driver spoke English, but as soon as I exited the arrivals hall, I saw the sign below. There was an official looking guy in the Blue Bird uniform who was taking taxi numbers down and also helping with loading luggage into the taxis, so I thought I would just grab this and hopped into the next available taxi to take me to my hotel. Again, as was the case with immigration, virtually no queue! By this time I was pretty pooped so just focused on staying awake as I didn’t want to taken for a complete ride. I can’t even remember how many toll booths I went through but I think it came to 25k IDR for tolls; and then about 200k IDR for the trip. If you enjoyed this post, please subscribe to my blog by click the follow button on the top right of this page. Thanks!! !